Hurricane insurance rates will be dependent on a wide range of factors including location, property value, current policies and more, and when it comes to hurricane insurance in Florida, these rates will differ greatly from one region to the next. Hurricanes can cause massive destructive – both wide-scale in the community and personally for those who are affected by damaged homes, businesses and more. By protecting yourself with strong insurance policies to safeguard you from the expense of repairing flood and wind damage, you can help yourself before you find yourself suffering from unexpected losses. Doesn’t Homeowners Insurance Cover Hurricane Damages? Possibly, but not definitely. Some homeowners policies do provide some protections for wind damage, but many do not. 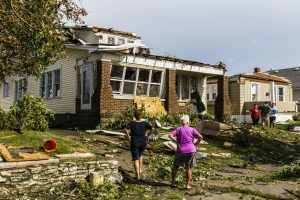 Even in instances where wind damage is covered, this will often require a separate deductible that is oftentimes 3-5% of the total damage costs. This means for those who are covered, the expense they will incur to repair their property will still be substantially more than the cost of most hurricane insurance rates. More importantly, homeowners policies do not cover floods. That means that any flood damage that occurs will be your sole responsibility. For hurricane coverage, you will essentially need to consider one or more additional insurance policies: flood insurance and windstorm insurance. Five Brothers Insurance can help you navigate each of the policy options available to you and has broad experience with personal and commercial policies of all types and coverages. Our family-owned and operated agency is dedicated to providing the most comprehensive policy options at prices families and businesses can afford. For more information about protecting your most valued investments from hurricanes and other catastrophic damages, contact Five Brothers Insurance today. We have helped hundreds of home and business owners throughout Tampa, Clearwater, St. Petersburg, Orlando, Altamonte Springs and the surrounding areas find the ideal hurricane insurance in Florida, and we look forward to serving you!